Increasingly, Reiki is used as an adjunct and complementary therapy for those managing stress, pain, and healing. Reiki is safe for adults, children, the elderly, and pets. Saturday morning is dedicated to Level 1. We will cover Reiki origins and principles, and spend the rest of the evening learning and practicing with Reiki, self-healing, discovering uses for everyday life, discussions, working with family and friends, pets, and more. Saturday is the Reiki Classroom. The day will be spent on an appreciation for Reiki origins and principles, attunements, learning and practicing with Reiki symbols, self-healing, working with others, discovering uses for everyday life, discussions and more. 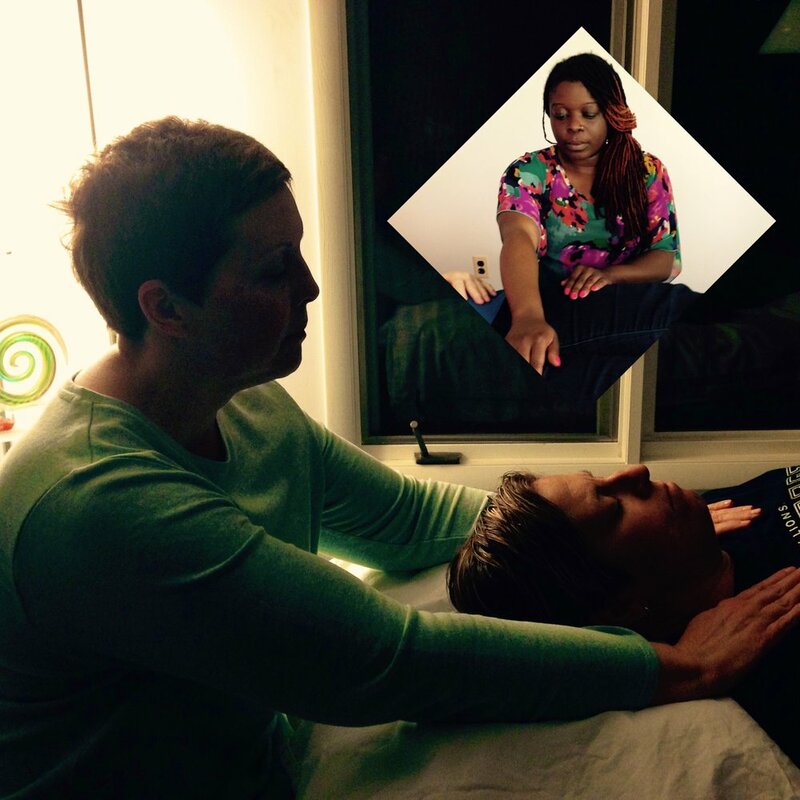 Sunday is the Reiki Clinic, a practicum or hands-on experience for Level II student designed to put all of what you have learned into action. Throughout the day, we will discuss ethics, professionalism, establishing a Reiki practice, participate in Reiki Circles sharing and receiving from other students, as well as completing one-on-one sessions with live clients. The hallmark of our classes and the clinic is providing knowledge, skill, and an intimate, interactive approach that instills a high level of confidence and fosters a deeper commitment to the practice of Reiki. Students leave the class empowered and prepared to begin using and sharing Reiki immediately. A fun and interactive, educational cooking class series for beginning and experienced cooks focused on foods from the African Diaspora, including the African continent, Central and South Americas, and the South and Southwestern USA. All foods prepared in the series are free of animal products and by-products, sugar and alcohol. Only a few recipes include gluten and these are easily avoided. Please notify us if you have any other food concerns. Each enrollee will receive a workbook with recipes. Class location: St. Mary's Woods Retirement Community - Enter driveway at tall blue flags on Gaskins, follow road straight back - park in first lot on the left and enter community room (next to the chapel). Prepared each week to learn, laugh, share, cook and eat! *Oldways is a nonprofit food and nutrition education organization, founded in 1990, with a mission to guide people to good health through heritage, and the sponsors of this cooking series. All personal information will be kept confidential. For statistical purposes, your measurements (weight/height/body type/inches/age) will be sent anonymously to Oldways (without your name or other identifying data). A fun and interactive educational cooking class series for beginning and experienced cooks, focused on foods from the African Diaspora - including Africa, Central America and the Caribbean, the Southwestern and Southern USA. Learn about the health benefits of essential oils and experience them for yourself. Bring a friend. It's FREE, so pls RSVP. Includes a targeted medical food supplement, a modified elimination plan, and the support of a certified integrative health coach. Real food and juices. No Starving. Limited slots available. Registration closes on Aug 31. JOIN Certified Integrative Health Coach, Aqiylah Collins this February for the Food Prep Series. We will meet every Sunday from 11AM - 1PM. Note: We'll be shopping in the west end of Richmond. Details on location and meet point will be sent upon registration. Whether trying to feed yourself or your family, grocery shopping can be a daunting task. But it doesn't have to be. If you are confounded in the grocery aisles, can't seem to fit organic into your budget, just don't know what to believe about food anymore, or simply need new ideas and recipes to perk up your meals, then be sure to register for this tour! You'll come away with new information, a new understanding, new ideas, and new recipes!